Palm Beach County's Full Service Swimming Pool Builders Best of Houzz! Palm Beach Designer Pools, Inc.
A&G Concrete Pools has been in business since 1987. We pride ourselves on our commitment to quality construction, a professional design experience, and a beautiful back yard as an end result. A & G Concrete Pools, Inc was founded by owner, Arthur Allen. After spending the previous thirteen years learning and doing every phase of pool building himself, Mr. Allen knew it was time to create a pool company that not only he, but the industry could be proud of. Travis came to work for A & G Pool in 2001 as a sales representative, became Sales Manager in 2006 and has recently become a owner along with Art. Art and Travis are both State Licensed Pool Contractors in Florida. A & G Pool does residential pool construction business in in Stuart, Jupiter, West Palm Beach, Port St Lucie, Jensen Beach, Fort Pierce and Vero Beach, Florida. We are licensed in many other counties throughout the State and travel extensively doing Commercial Pool projects. We have achieved an excellent reputation in every municipality we build in. From the initial meeting with our professional design staff through the final meeting with our service staff, you will realize that you are building with a superior pool company. Our professional design staff will impress you with the latest technology of the CAD designing system. You will be able to see what your pool will look like in your backyard as quickly as the first visit to the A & G Pool showroom. For your choice, we offer an excellent selection of tiles as well as the latest in technological equipment by Jandy that allows you to operate your residence pool/spa and landscaping at the touch of a button. From the comfort of inside your home, from a wireless remote, a Smart Phone or an I Pad, controlling your home pool has never been easier. We also carry a beautiful selection of affordable bronze fountains and Summer Kitchen essentials that are duplicated by no other pool company in this area. Sunsational Pools and Spas is more than just a new pool construction company. Our wide range of services meets the needs of existing pools as well and makes renovation an affordable reality. Whether you are looking to create your own private retreat or a cozy, classy outdoor entertainment area, we can help you see the bigger picture, then see it through to completion. We are a structural builder and can help you reach your dream even if it takes a few years by laying the groundwork now for the different phases of your construction. From the smallest repair to the creation of an entire backyard paradise Liquid Art Custom Pools is focused on quality. Our Goal is not only to turn your vision into a reality but also to exceed your expectations in all ways: workmanship, professionalism and of course, the final product. Liquid Art Custom Pools is a State Certified Pool Spa Contractor with no gimmicks or questionable sales tactics. You will deal with the owner of the company directly through the entire project. Contact us today to set up a free estimate, and get the backyard you have always dreamed about. We specialize in new pool and spa construction, pool renovation & remodeling, custom water features, natural and artificial rock waterfalls, and pool resurfacing. What exactly do West Palm Beach pool builders do? If you are planning for a new pool in West Palm Beach, FL, a swimming pool builder will analyze your outdoor space and your aesthetic wishes to determine an appropriate design for your yard, installing it once the plan is developed and approved. Once installed, some pool companies in West Palm Beach, FL can handle the necessary cleanings, water testing, renovations and equipment replacement or repairs for your pool or spa. If not, many can also suggest West Palm Beach, FL swimming pool contractors or maintenance services to help with upkeep or repairs down the road. Here are some related professionals and vendors to complement the work of swimming pool builders: Garden & Landscape Supplies, Landscape Architects & Landscape Designers, General Contractors, Landscape Contractors, Solar Energy Contractors. Before hiring a swimming pool construction company to create your new West Palm Beach, FL pool, determine how you'll be using it. Will it be for fun or for lap exercise? Will the primary users be children, adults or a mix of the two? Knowing the use can help you find West Palm Beach pool builders who shares your aesthetic. Once you find swimming pool builders in West Palm Beach, FL who share your style, research is critical. Review customer references and comments, collect at least three to four estimates to compare, meet with potential West Palm Beach pool designers and builders in person and ensure that they are Florida certified service professionals and licensed with the registrar of contractors before making any final decisions. In addition, get a sense whether they plan to complete the pool installation and be done with it, or whether they seem interested in building a long-term relationship with you. Be wary of the former: it's likely a reflection on the level of quality of the pool construction they do. Find a West Palm Beach pool contractor or designer on Houzz. Narrow your search in the Professionals section of the website to pool builders in West Palm Beach, FL. 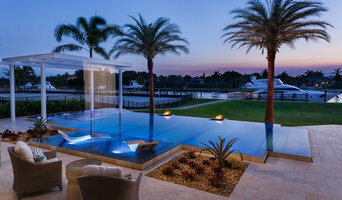 You can also look through West Palm Beach, FL photos by style to find a pool or spa you like, then contact the local pool company who designed it.